AquaKler™ is a unique product specifically formulated to provide months of time-released oxygen in aquatic media for the immobilization of Phosphorus. The rate at which the oxygen is released is based on the need of the water being treated. When dissolved in water, AquaKler breaks down, releasing oxygen into the water at a slow but constant rate. As a result, AquaKler functions as a water conditioner that provides a comfortable environment for aquatic life such as plants, fish and other aquatic animals. 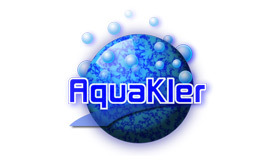 AquaKler provides essential dissolved oxygen. This is mainly beneficial to fish and other aerobic organisms, and it solves the problem of oxygen-deficient ponds. The ratio of dissolved oxygen (DO) between organisms and the water keeps the pond in balance. AquaKler provides a stable and continual source of dissolved oxygen. This makes AquaKler an economical and ecologically sound aquatic treatment for oxygen-deficient water. AquaKler improves the pH value. Research and practical usage has shown that AquaKler improves the sub-aqueous (sludge) pH and prevents water from acidifying. AquaKler reduces the sub-aqueous content (sludge). A heavy sludge content prevents fish and aerobic bacteria from reproducing and disrupts the aquatic ecological balance. AquaKler has shown its ability to dramatically reduce sludge content in organic laden aquatic bodies. AquaKler drastically reduces carbon dioxide and Hydrogen Sulfide. Excess carbon dioxide hinders oxygen absorption by aquatic life and results in excess organic matter. AquaKler removes Hydrogen Sulfide compounds by releasing oxygen. This improves water quality from the pond floor to the surface. AquaKler helps clear turbid water. This improves total health and balance of the aquatic environment.